Saloon has Seating for 4 with Table. When looking for a top-notch, professional, successful Bahamas fishing charter, the 38-foot Defender known as the “Strike Zone” is without question one of your best bets. This is our Nassau fishing charter boat that is perfect for small or large groups, as it is not too small and not too big. This boat is perfect for offshore (deep sea) fishing or light tackle (reef) fishing. The boat is even great for simple sightseeing or snorkeling tours, but its real glory is seen on a Bahamas fishing private charter. And when it comes to Bahamas fishing charters, Captain Paul of the Strike Zone is one of the experts! Captain Paul of the Strike Zone and his amazing team of highly qualified, extremely experienced, and knowledgeable local tour guides will show you a Nassau fishing excursion that you will remember for years and years to come. This is the kind of fishing that you expect when you are coming to the Bahamas. The Bahamas are known for their excellent fishing opportunities, offering visiting anglers a wide variety of fishing including shallower water reef fishing and deeper water offshore fishing. 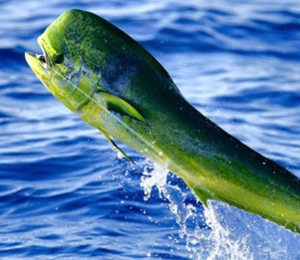 The species you can catch in the waters of the Bahamas are also quite diverse, ranging from deep sea species like marlin, sailfish, wahoo and mahi-mahi, to the reef species like grouper, jack crevalle, and barracuda. Whatever type of fishing you are interested in, the team with the Strike Zone will be able to provide you with that trip. These fishing guides are highly experienced in both deep sea and light tackle fishing, and they are trained to help you as little or as much as you want during your fishing charter. The Strike Zone itself is an ideal vessel for fishing in the Bahamas. The boat comes fully equipped with all necessary fishing gear as well as fighting chairs, plus it provides the most in comfort including a fully air conditioned cabin, bathroom, saloon with seating for four with a table, and a galley with a fridge and sink. If the activity be cancelled due to bad weather, and you cannot reschedule, you will be issued a full refund. I have been to the Bahamas many times, but The Strike Zone - 38' Defender is one of my favorite trips! It includes everything that everyone should do here. As a Bahamas veteran, I can say only the best about this experience!